You might think Rubber Ducky makes bath time lots of fun … this year let’s make learning Bath Time Fun. When we first started homeschooling lessons were completed at the desk, during our “homeschool time”. Until the day my son could not subtract. He just didn’t understand “take away”. He was becoming frustrated and self conscious. I was becoming frustrated and overwhelmed, so we called it a day … very early. That night during bath time he played with little plastic dinosaurs. It was cute. Then he started using words from earlier in the day, “I’m going to take away you and you and you … and now I have 3 big dinosaurs, rawrrrrr”. I jumped at the opportunity to finish our subtraction lesson by playing with him beside the bath tub. 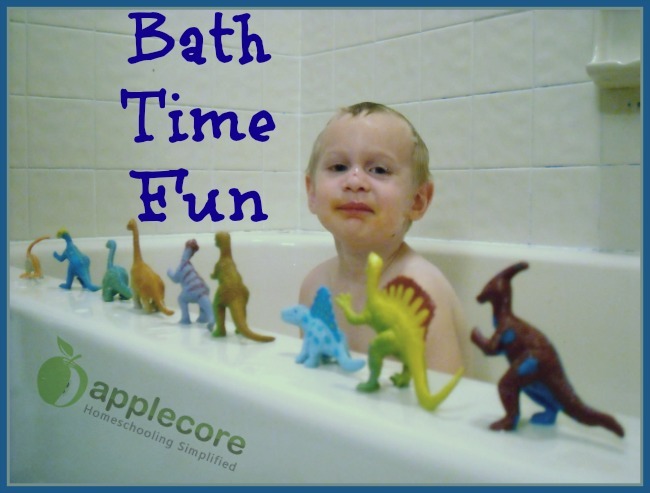 We were taking away all kinds of dinosaurs and mastering subtraction elbow deep in the bubbles during bath time. It was fun! I learned that day to use bath time for learning. Leave the books, rulers, and planners out of the bathroom and simply enjoy the relaxed learning environment. Shaving cream is also a great addition to any bath time fun! 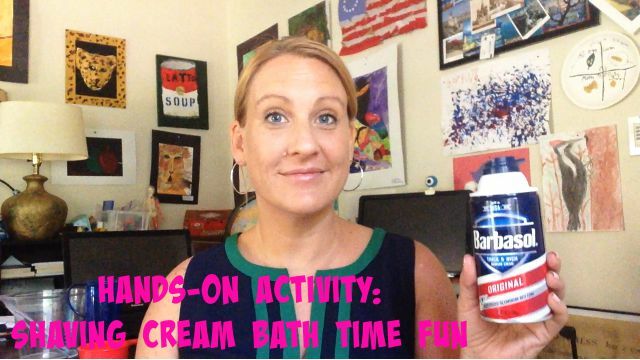 Check out my short 2 minute video: Shaving Cream Bath Time Fun. I share how we incorporated shaving cream and paint brushes to work on delayed fine motor skills. Bath time is not the place to introduce molecular fusion, but you might draw a map of your state. Or planets in the solar system. You might help your child to remember a phone number. Or how to spell their name. You can work on grouping toys to introduce multiplication, or just relax and play Hangman. Use bath time for their learning advantage!